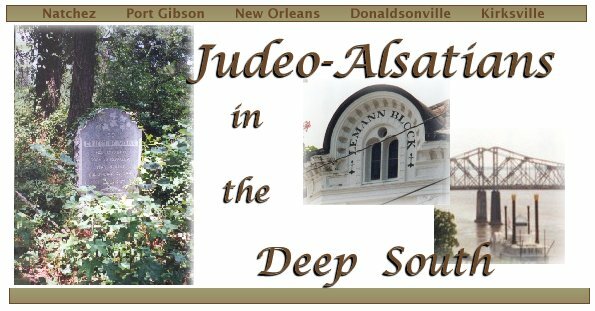 A journey in memory of the many Alsatian Jews who, in the 1800s, settled in communities along the Mississippi River in the southern states of Mississippi and Louisiana, USA. According to information compiled by the Museum of the Southern Jewish Experience, Alsatian Jews were attracted to the Deep South by the landscape, which was much like what they had known, and also by the slow Southern lifestyle, much like their own in Alsace. The Alsatians were also attracted by the compatible French language and culture of Louisiana. They began immigrating to the Deep South in the 1820's, in even larger numbers in the 1850's, and then in large numbers again when Germany occupied Alsace after the Franco-Prussian War. The Museum of the Southern Jewish Experience, located in Utica, Mississippi, is presenting "Alsace to America: Discovering a Jewish Heritage", open December 1998 through Spring 2000 by appointment. 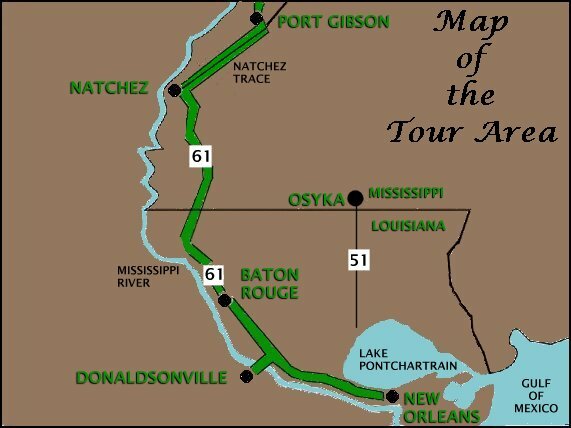 The places described in the following pages are a few of the Museum's recommended stops along the Cultural Corridor - Discovering Jewish Heritage Along the Mississippi River. Carol Levy Monahan was born in New Orleans, Louisiana. Her Jewish roots begin in Strasbourg, birthplace of her grandfather, and extend to almost every part of Alsace and into Moselle. She is a member of: the Jewish Genealogy Society of New Orleans, serving as Secretary and Newsletter Editor; and a member of the GenAmi Association of International Jewish Genealogy, serving as the USA Correspondent. She is a volunteer web designer for non-profit groups in the New Orleans area, and a soon-to-be-retired Counselor, currently employed at Tulane University.